Okay, I caught some deserved ribbing for the now famous Tesla (TSLA - Get Report) short yesterday. Went to work on managing that position immediately after the close last night. The risk is well under control at this point, and I expect to post a profit on that trade Thursday. Funny, plenty of the feedback on the Tesla short call last night, but not since the stock came in, and nothing on the Netflix (NFLX - Get Report) short call that worked to precision last week. Such is life. Tonight, we'll hear from half of the FANG grouping of formerly red hot growth stocks. As Alphabet (GOOGL - Get Report) , formerly known as Google, and Amazon (AMZN - Get Report) go to the tape with their third quarter results, after hours markets should get fun. First off, I come in flat GOOGL, having sold half of my long at $1270 back in the summer, and the rest at $1187 in September. Score one for the good guys. After the Pentagon thing, that stock is now off my radar... but what about Amazon? That name, for me as a trader, is still very much in play. Let's go there. The stock tip-toed below it's own 200 day SMA last night. I don't focus on that slice of technical data as much as some other traders do, but I thought this significant as this was the first instance of this for this name since 2016. This is a name that I feel has required a high touch approach in recent times. Two weeks ago I doubled my long here when the stock sold off hard. Last week, I took off that "trade" leaving my core position in tact. I also regularly drive revenue in this name by selling very deep out of the money puts that, given the risk level, still provide decent enough premium value. In fact, I am short some puts that will expire tomorrow, and if they end up being exercised, then we all have bigger problems than we know. Tonight, investors will want to hear about the very many drivers for revenue that this firm seems to dominate, and a certain amount of continued growth that might be expected. Consensus view on Wall Street is for Q3 EPS of roughly $3.14 on revenue of $57.1 billion-ish. Whispers are running seriously to the high side on EPS, so much so that I am somewhat concerned that a whispers miss could cause a problem. Keep in mind that the firm itself guided Q3 revenue to a range of $54 billion to $57.5 billion at the time of the firm's Q2 release in July. 1) Amazon Web Services. Yes, Amazon is the cloud king of cloud kings. Top dog in the public domain. Q2 growth for this segment was 49% y/y, but the real question might be whether or not number two Microsoft (MSFT - Get Report) is closing the gap. 2) E-Commerce. Obviously, AMZN is the leader here, but are they capturing more retail market-share overall? 3) Prime membership. Nothing beats a captive audience. Nothing beats the subscription economy. Jeff Bezos understood this long before the rest of us, and is way ahead of any competition in driving this kind of revenue. On top of that, nothing beats actual hardware in your home that keeps you captive. 4) All of the above do what? Drive advertising for the firm overall. Oh, operating margin and cash flow are fundamentally important, but capturing advertising sales... that's what folks care about right now. As you can plainly see, Relative Strength, Money Flow, and the daily MACD are all uncharacteristically weak for this name over the past six weeks. I really wish I added to my long at last night's prices, but I was simply up to my eyeballs in alligators at the time. 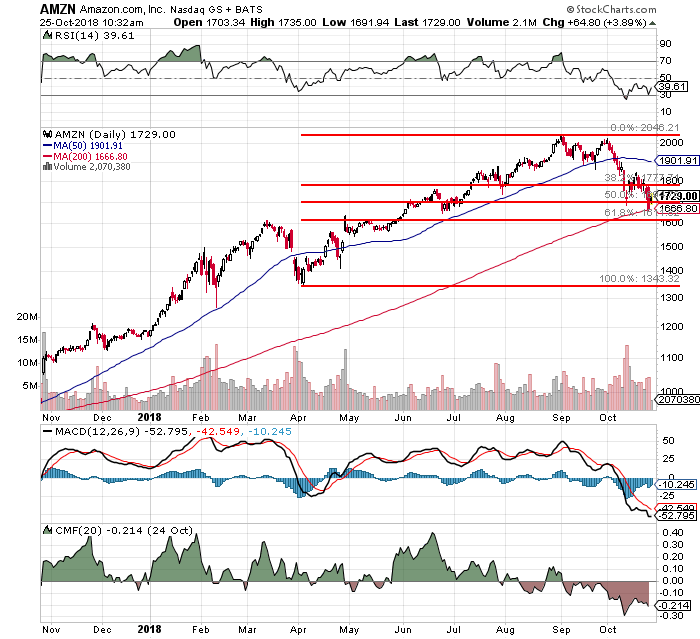 I would love, love love to add to Amazon between the 200 day SMA of $1666, and the 61.8% retracement of the April through September move of $1610 (ish). That's not likely, so I will ride what I have. Above $1800, I make a sale. I will also, by tomorrow, scout the options grid for something on the put side most likely to pay me something for nothing. In the event of a market crash, this can get your face ripped off. In the meantime... it's untapped cash flow. You've been warned. At the time of publication, Stephen Guilfoyle was Long AMZN equity, Long MSFT equity, Short TSLA equity, Short AMZN put options.